Web design, logo design, catalogues, brochures, ads, newsletters, stationery, business cards, CD covers - I do the lot! With nearly 20 years experience in art and graphic design with outfits as diverse as Harvey Norman Advertising, the Bright Print Group, Thomas Marsden Advertising and The Land Newspaper (Fairfax Media) you can trust that Craig Rogers can help you meet your deadlines in your hour of need. You will be assured of the highest ethical practices and prompt, efficient service at all times. You'll be dealing with an experienced professional graphic designer who can work to a brief and understands the need to meet deadline. Web design, graphic design, layout, print and illustration - and now servicing the Illawarra, from Wollongong to Bateman's Bay. 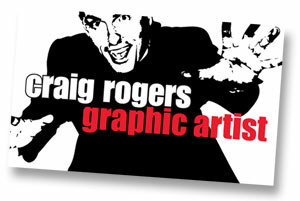 Craig Rogers - graphic designer and freelance graphic artist.